I finally found the time to paint “Ossiriand”. I can’t believe I’ve been struggling with brighter colours for years. The combination of the good ol’ Dockers with Canson is certainly an assault on the rod cells! 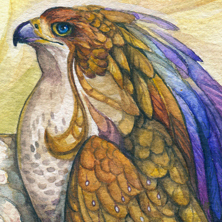 The first stage was to put a yellow wash over the entire pic, to achieve a golden sunlight glow in the end. I made it less pronounced where the sky would later go, so as not to end up with a green sky. … and mixed some rather pale green for the greenery in the back. You see my putting down quite a lot of wet-into-wet paint there, for vegetation look that’s not too detailed. Now for the leaves in the foreground, I used a somewhat more detailed approach. I’ve often tried, over the years, to achieve mind-blowingly detailed greenery by wishy-washy-wet-over-wet stuff. Needless to say, I never found the magic formula. The only way to do detailed greenery is with small brushes and painted details. I already laid some of that down in the lineart. Now I start painting the foreground leaves – detailing a few select leaves by highlighting the veins (painting around them), using a rather yellow green tone so they’d really catch the sunlight later. 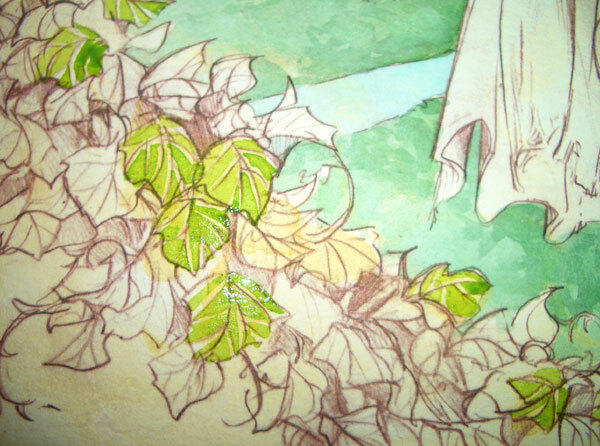 Then I painted the rest of the leaves in the same green tone. Then I go in with a second, more bluish green tone, painting over some of the blocked in light green leaves, again leaving out the veins. Some others I completely paint dark, others I leave light green. So with these two tones, I paint four kinds of leaves: the light ones with “white” veins you saw above, dark green with light green veins, light green without veins, dark green without veins. This makes for a lot of very lively variation with pretty little effort. For some more realistic lighting, I paint in some darks with a touch of red – now the leaves really pop. I then begin to fear that the reddish foreground will completely upset the colour unity, and lay down a stronger yellow foundation. The first layer of horse coat (and Maedhros’ hair). I should add that what Doc Martin calls Burnt Sienna isn’t Burnt Sienna at all. I had to do quite a lot of mixing before I got the tone right. For the second layer of horse coat, I added some more reddish-brown hues, but rather close to the first. At which point my camera just quits and picks up all sorts of hues.Note how, in the pic above, the horse looks rather out of place. This will be remedied in the shadows. For the shadows, I mix in lots of blue, to reflect the colour of the grass in the shadowy areas. This ties the horse to the surroundings. Except this one – his boots. I relay liked the details here. I’m glad you did, this is gorgeous! Great composition, lovely colors. It looks fantastic, and thank you for such a detailed breakdown of your process – especially the foliage. It’s really helpful (as are all your walkthroughs and tutorials). You mentioned that you toned down the saturation in the final painting. Did you end up doing that with some desaturated color glazing, or with tweaking colors and saturation after scanning? All of the above :) I tweaked some colours via ctrl+u, and laid a “colour” layer on very low opacity (7% I think) of bright yellow over everything. Beautiful, as always. The colours are actually amazing – and I love the effect you’ve achieved with the horse. It’s like you can really feel the movement in the picture. Also, I’ve been wondering what brushes you used for this? Because you always get such detail in your paintings. Omg! Jenny it’s gorgeous!! The colour’s are absolutely stunning, i love seeing your progress from the beginning to the end , i wish i could paint like this. Where do you buy Dr Martin’s Liquid Watercolours? I bought mine online, at dickblick.com. Depending on where you are, there are other lines of liquid watercolours – Stockmar, Pebeo. Not many – a German RPG book, a Song of Ice and Fire artbook, and an artbook devoted to a German Fantasy series. All of them older. ;) I haven’t done a lot of high profile work. This is a really great tutorial. I am still trying to teach myself to water color, and I don’t have a lot of time so I’m stuck just using water color pencils with limited results. Thank you so much for this tutorial. I have a question. 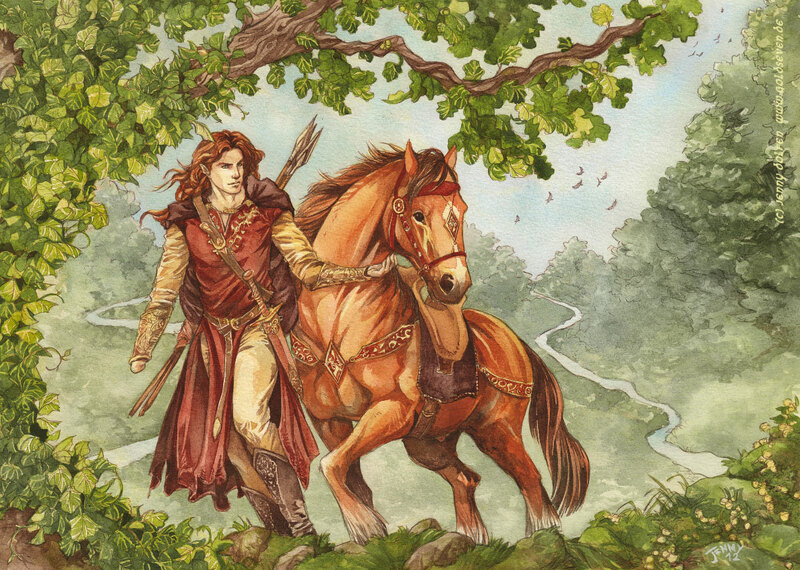 Is it the perspective or is Meadhros’ hand touching the horse a little small? Something I noticed after staring at it for a few hours (as a desktop background) – it looks like a tapestry! I simply ITCH to print this on cloth and then embroider it. *checks again* Yep, totally doable. This is really helpful, and really awesome to see your process! I usually use a purple for my green shadows, but I will have to try red (which actually makes more sense, seeing as how they’re compliments).